The Bureau for Paranormal Research and Defense's ongoing war against the frog monsters explodes in five short stories set before Roger's death in B.P.R.D. : The Black Flame. * Collects B.P.R.D. : War on Frogs #1-#4, "Revival" from MySpace Dark Horse Presents #8-#9, and an original eight-page story by Guy Davis. 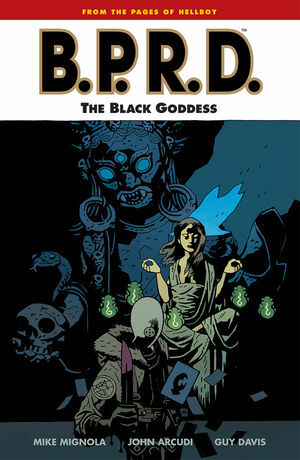 * The covers of all new volumes of B.P.R.D. include the line "From the pages of Hellboy" above the title. * Series writer John Arcudi and Hellboy creator Mike Mignola join up with an incredible team of artists: John Severin (Two-Fisted Tales), Karl Moline (Fray, Buffy the Vampire Slayer), Peter Snejbjerg (Starman, The Books of Magic), Herb Trimpe (The Incredible Hulk), and multiple Eisner Award-winning series artist Guy Davis!